After nearly 8 months in the making, the 2nd annual, Hayden Homes $25,000 Dream Backyard Giveaway culminated this Month as Shane & Alex Hunter and their family were presented with the prize of a lifetime. 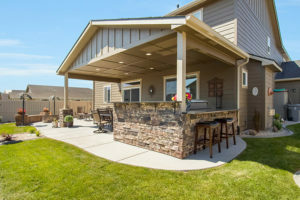 The Hunters are residents of our Antler Ridge community in Boise, Idaho, and were surprised as the lucky winners among thousands who entered to win the $25,000 Dream Backyard Giveaway, in December of 2016. After meeting with Hayden Homes’ CEO, Dennis Murphy, in April of this year to discuss ideas and their vision for an outdoor oasis, construction on the yard, which started out with no landscaping, began at the end of May and concluded this August with a Backyard reveal and community celebration open to their neighbors and the public. the completed yard, which captivated all. A vast covered patio is the focal point of the yard. 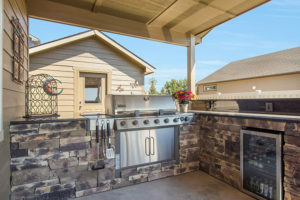 Beneath the covered patio is an expansive outdoor kitchen equipped with refrigerator, gas BBQ, & granite countertop bar. 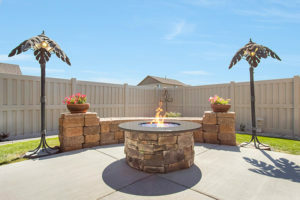 Adjacent to the covered area is an inviting gas fire pit for friends and family to gather round, perfect for entertaining. The stunning landscaping features a crushed rose quartz path, with favorite plants, and flowers of Alex. Trees accent the border of the yard, as well as a custom built storage shed. Congratulations to the Hunter family! Your backyard oasis awaits!